This is the escape to the mountains you've been waiting for! Come relax and enjoy our 2 bedroom, 1 bath cabin. Comfortably furnished with two queen sized beds, and all of the amenities you need for those romantic nights after cooking dinner and then sitting by the fire. The cabin can sleeps four (4) comfortably. There are HDTVs in both bedrooms as well as the living room with internet service, and free moving streaming services. Our cabin takes full advantage of the breathtaking mountain view and nestled into the mountain side. 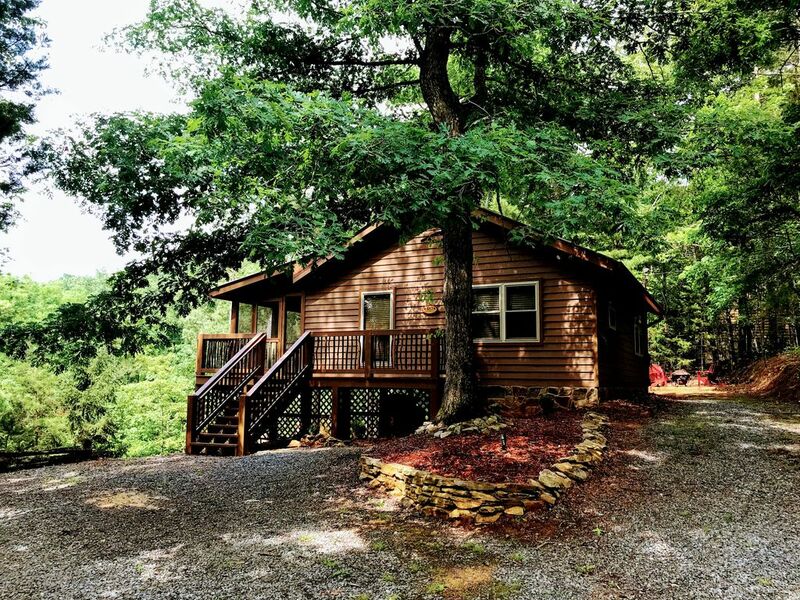 Bear Creek Cabin is perfectly located between Blue Ridge and Ellijay with access off of the main road Hwy 515. Come enjoy a train ride, dining, shopping, horseback riding, hiking and biking, fishing, whitewater rafting, canoeing, or a lazy day tubing down the Toccoa River. After a busy day enjoying the many activities available, spend a quiet evening relaxing on the front porch taking in the sounds of flowing water from the fountain or enjoy a fresh beverage and good read while relaxing on the large furnished rear deck. Take a walk down to the creek located at the rear of the property and enjoy the sounds of the bubbling creek. We look forward to your visit and would love the opportunity to serve you.